My personal website get’s a face lift. Yes, it is a hobby of mine. Check it out and leave your feedback in the comments! People like to share code in comments. But, come on, it NEVER works! So I’ve made it easy to share code. 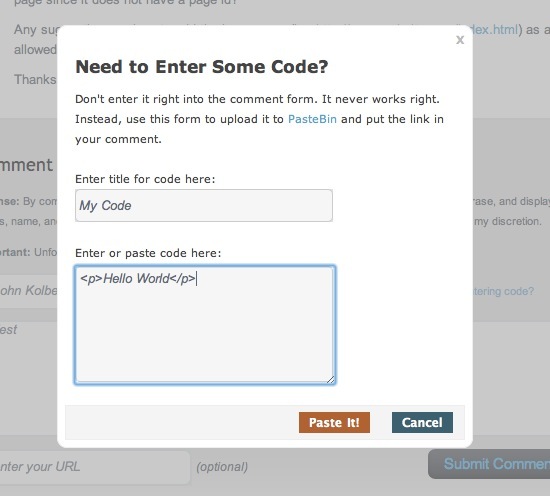 Simply click on the “Entering Code?” link when commenting, and a popup will let you enter your code in, submit it to PasteBin, and automatically put the link into the comments. No more messy code not playing nice any more! All of my project pages have been redesigned. What do you think? Are they easy enough to use? I’ve done this in preparation of sharing additional info about a special project I’ve been working on for some time. So, what do you think? A good change? I’d like to especially thank The Webcrafters, a fantastic duo who came up with this design for me. I’ve used them for other projects and am always pleased with their high quality, reasonably priced work. In the next few days I’ll be publishing a post detailing how I accomplished a lot of the things with the redesign (PasteBin API, custom post types, and more!). Thanks everyone!